The Super 8 of Sturgis welcomes you to the beautiful black hills of South Dakota. 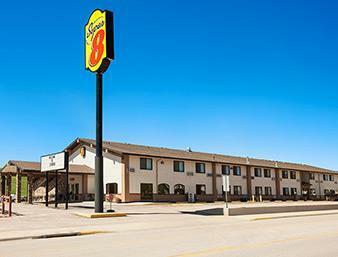 The Super 8 is centrally located to all Black Hills attractions. We are just minutes away from Mount Rushmore, Deadwood Casinos, Bear Butte State Park, Spearfish Canyon, and Black Hills State University. After you have spent your day traveling and exploring our beautiful state, park your car in our large secure parking lot, then let our professional and friendly staff assist you in finding the clean and comfortable room that will fit you and/or your familys needs in our 100 percent smoke-free property. Enjoy expanded cable TV with remote control featuring ESPN, Fox News and Disney. Join us in the morning for our complimentary SuperStart breakfast. See you along the way. Sorry, no Pets Allowed. In the 1990s this research museum lost its T-rex "Sue" to Chicago -- much to its displeasure -- but it now has a T-rex named Stan. "A life-changing patriotic experience!" claim the billboards. Learn about the man behind the big heads on Mount Rushmore. Some statue photo ops outside. Bigger than Mt. Rushmore. More than a head. Decades spent carving and blasting by generations, like the pyramids of old. And still not finished! A popular Black Hills reptile ranch and classic tourist attraction, with performing chickens in boxes and the largest collection of reptiles on Earth, including a giant crocodile named Maniac.